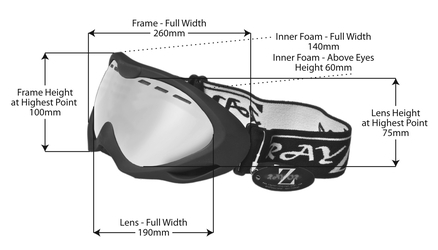 Home Snowboard & Ski Goggles RayZor Black Framed Goggles With an Anti Fog Gold Iridium Mirrored Vented Double Lens. UV400 Gold Iridium Mirrored Anti Glare, Vented Spherical, Wide Vision Clarity Lens. The RayZor Gold Iridium Mirrored Sports Lens Provides True Colour Definition, Reduces Glare and is a perfect lens in Bright Sunny Conditions. Excellent goggles,fast delivery, can't wait to try them out. thanks.